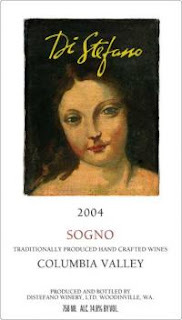 The 2004 DiStefano"Sogno" is a 1,100 case production red wine from Columbia Valley Washington and is composed of predominantly Cabernet Franc (91%) and the rest Cab Sauv (9%). As one might imagine the aromatics on this baby are quite expressive and Cabernet Franc is known to be far more perfumed than it's wild son Cabernet Sauvignon. The bouquet expressive amazing notes of rich dark chocolate truffle, dusty coco, blackberry, cherry, red currant, spice, cedar, and a touch of herb and peppercorn. I love love LOVE Washington State cabernet franc! I wish I could get this in Memphis. Side note-are you going on (or have you been on) Washington Wine Road Trip? Furthest North I've been is Willamette. I will go to Washington wine country very soon!